Traditionally, the path from an advertisement to your webpage and checkout didn’t happen instantly, and that was normal for shoppers who were browsing online. Now, the path from advertisement to checkout (or even introduction of the product to checkout) is seamless. If you limit your e-commerce store to your website, you create many steps from initially displaying a product to making a purchase. Users who have never heard of your business or products before can now make purchases in an app. Create a seamless transition from initial introduction to final purchase with Instagram’s latest feature, Instagram Shopping. If you are advertising your products on Instagram already, you’re on the right path. Instagram is a huge platform; possibly the most important social media platform for e-commerce businesses. Visual content is key to advertising and selling products, and with Instagram Shopping, the opportunity to sell products within the app is even easier for users to navigate. Instagram users like over 4 billion posts every day. Instagram made nearly $7 Billion from mobile ads in 2018. Instagram Shopping is still a relatively new feature, but it is already proving to be a big moneymaker for businesses. After all, it’s a great way to capture someone’s attention and introduce them to your brand. 60% of users have reported discovering new products on Instagram. 75% of users respond to CTAs offered on business posts. Instagram is a crucial part of the buyer’s journey. Use Instagram Shopping to reach leads who are ready to convert and call them to take action without leaving the app. Instagram Shopping is new to most users, but Instagram has been working to trial and improve this feature for over a year. Now it’s available in over 40 countries, including Australia and New Zealand. Each post can tag over five products that buyers can purchase within the Instagram app (multi-photo posts allow up to 20 product tags.) Businesses set these products up before they post. Once a post is set up with Instagram shopping, users can get all of the information they need with a single tap. Normally, users will just see the tagged users when they tap on an Instagram post. With Instagram shopping, users will see the name and price of products tagged throughout the post. When the user clicks on the tag, they will see a larger picture of the product and a product description. These posts give users the option to “Shop Now” and head directly to a page where users can purchase that product. If you have seen any Instagram posts with a shopping bag icon in the top-right corner, you have already seen these posts. E-commerce businesses should take advantage of this great opportunity to boost user experience and boost sales. 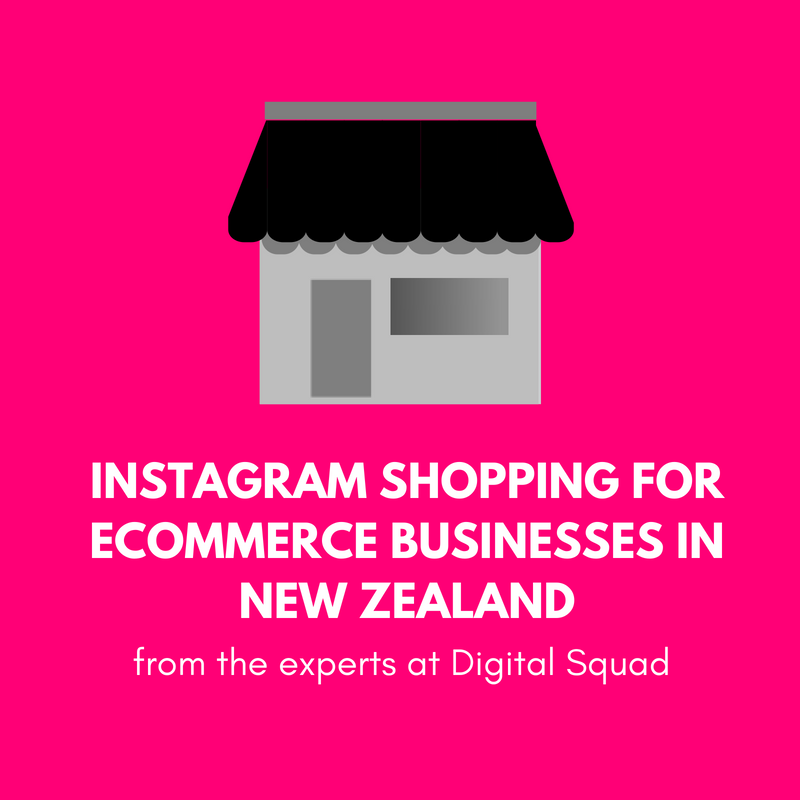 Qualified businesses can set up a store on their Instagram to ease the transition between social media content and the final sale. Rather than earning a commission from each individual sale, Instagram charges fees in advance. These fees allow businesses to set up their store and promote their posts on Instagram. Even people who are not following the specific business page will see these posts. Use these tips to ensure that your Instagram Shopping account advertises your products well and provides optimal customer experience. Create posts with Instagram Shopping in mind. Now that you know that your posts can be tagged with individual products, you have more opportunities to drive traffic, but this traffic may be different than what you are used to. Talk to your team about creating content that has this seamless transition in mind. Make sure photos with tags clearly display each product, and your captions encourage users to tap and buy. Add tags to past posts. Instagram Shopping should be a part of your overall Instagram strategy moving forward, but don’t forget to look back at other high-performing posts and see where you can integrate product tags. Instagram Shopping allows you to edit existing posts and add tags, so use this opportunity to reach users who may be scrolling through your timeline. Add posts without product tags. Not every piece of content has to encourage users to buy. Your Facebook updates don’t always include a hard sell; your Instagram posts shouldn’t, either. If users are seeing your posts for the first time, they may not even trust your brand yet. Create a variety of posts that do more than just call users to Shop Now. The more content users can engage with, the more likely they are to come back to your Instagram page and eventually make a purchase. Take advantage of Instagram Live. Tell your story off of your company profile. Take advantage of Instagram Stories and broadcast live video to your followers. Users love video content. If you are starting to add product tags to individual posts, show these products off in a live demonstration. Instagram Live allows you to tell your story in greater detail and directly interact with customers in real time. Plug your shop throughout the video and direct interested users to head to your page and browse through the inventory you have online. The integration of Instagram Shopping can be an event worthy of announcing on Instagram Live, so get creative with how you tell your story and announce new updates. Are you using influencers to promote your products on Instagram? Talk to them about Instagram Shopping. Influencers who qualify may be able to tag their own photos. If your influencers do not have Instagram Shopping on their profile, reach out and see if you can use their photos for future content. This is a quick way to generate high-quality content; all you need to do is tag your products and schedule! Instagram Shopping is just one big update that Instagram has announced recently. In March 2018, the platform announced that it would be changing its algorithm and rearranging the priorities in which posts were shown to users. Rather than prioritising posts that Instagram thought would interest customers, the new algorithm leans more toward listing posts chronologically. Posts still aren’t purely in chronological order, but this change requires businesses to think more about the most optimal times to post. This concept applies to posts with tagged products; at what times are customers ready to buy? Take advantage of Instagram’s new and changing features and update your Instagram account constantly. Sell your products on a variety of social media platforms. In addition to Instagram and Facebook Shopping, e-commerce businesses should take advantage of Pinterest’s Buyable Pins and Amazon Spark. A smooth transition through different social media platforms and websites is key to user experience. User experience is key to maximising sales. Instagram Shopping allows you to view individual insights on your products and posts. Keep track of these insights and your growth over time to see with products are selling the best on Instagram and how/when you should add more shopping posts. Once your customers have bought products on Instagram, your still have work to do. Collect and segment contact information from these users to get specific information on their experience using your Instagram profile to purchase products. Since Instagram Shopping is so new to the eCommerce world, feedback is crucial and extremely useful for your business. Send out surveys and ask for testimonials about the products you have sold on Instagram, and use this user-generated content to boost sales further. If new users see that other customers have bought and enjoyed products purchased on Instagram, they will be more likely to take the leap and become a customer themselves. Facebook and Instagram are just two ways to optimise your e-commerce strategy. If you are looking to boost sales, increase ROI, or expand your reach, look at where users are interacting with your business. There are so many different stages of the buyer’s journey, and many different platforms to optimise and analyse. Create a comprehensive social media and content marketing strategy with Digital Squad. Digital Squad is a top SEO and digital marketing agency in Auckland. We know how to create and distribute content for every stage of the buyer’s journey. Whether you are looking to generate leads or boost overall revenue, our experience and knowledge can help you reach your goals.